On the contrary, there may be some who would agree that the lower cost chiptuning option is nothing more than a tuning charade that has led to a stream of online blatant disbelief and skepticism. Here's what I have to say about it after a month of use. With the European manufacturer of the RSchip claiming that an increase of 29bhp and 37Nm of torque would be realised on my Lexus GS300 with this little box, I couldn't help but to give it a shot on my direct injection V6 (3GR-FSE). Out of the box, the RSchip doesn't look like much and was no larger than a packet of cigarettes. 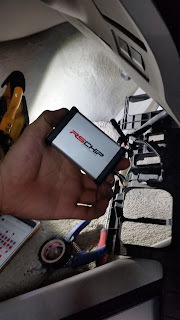 Wasting no time, out came some plastic panels to expose the OBD port and the RSchip was connected to the factory ECU via the OBD port wiring. I must admit that the installation was a breeze with the correct leads clipped to the OBD wiring. 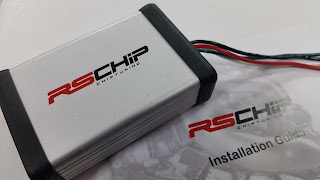 All the RSchip does was to influence the signals going to the main ECU. This was very similar to piggy backs like the Apexi Neo that I had in the past, only simpler. And the good news is; the RSchip is fully transferable to almost any NA vehicle. Certainly no money wasted there as no customised wired harnesses were required. A true plug and play universal chiptuning unit that's quite innovative. First impressions were quite positive as the car felt lighter as the response of the throttle had been altered to a marginally more 'aggressive' nature. Not bad considering the RSchip was priced somewhat in the RRP of S$600+ region. After some run in, self mapping and a depleted tank of fuel, I was looking forward to some results. Unfortunately, there were no noticeable improvements in fuel consumption but a slight increase in power and throttle response could be felt. On a good day, the V6 revs and pulls throughout the powerband effortlessly particularly when the cams come on high around 3500 to 5000rpm. So was there a 29bhp jump with 37Nm of torque as claimed? In my humble opinion, a 29bhp increase was definitely not felt with this tiny box. I do not think a dyno printout was necessary to prove a point but perhaps a 3-5% increase in power output seemed like more legitimate an outcome than what had been advertised. If you can afford it, I suppose nothing beats a full blown ECU or an advanced tunable piggy back. However, if simplicity is the key; coupled with a smaller investment appetite, get the RSchip for better throttle response and a marginal performance upgrade. While performance gains are subjective engine to engine, do not expect drastic differences or you will be dissapointed.